A look back at things we were told the BlackBerry "will never have"
I have fond memories of all the BlackBerry devices I've used over the years. Back in the summer of 1998 my first RIM device was called the 'interactive messenger' -- it was similar to the BlackBerry device but had a couple of interesting features that were quite popular; "text-to-voice" and "text-to-fax" allowing you to compose a message and have it delivered by fax or by Stephen Hawking via phone. As with any product that exists the people are never content with what they have and always want more, and I am certainly no exception. Last week I was having drinks with a friend and was showing off my BlackBerry Torch and all it's BB6 goodness, and I started thinking about how far RIM has come in the BlackBerry world. Things BlackBerry "will never have"
I started telling my friend all the features the current devices have that RIM has claimed over the years the BlackBerry will "never" have. Those of us who've been around for a long time have heard the battery and security claims time and time again. As the list of things grew I realized that this would be a great "look back" article for CrackBerry.com. So here is a list of things the BlackBerry "will never have". phone - who would want to hold a calculator up to their head? color screen - it will KILL your battery and why does email need to be in color? 3G - why does a BlackBerry user need their email any faster than they're already getting it? HSDPA and EVDO are big battery drains. Tethering - This just yells security risk, by pass the RIM NOC? No way, plus the device isn't 3G who would want to tether over GPRS or EDGE? Looking at these lists it isn't hard to laugh and say RIM should never say never. However, the madness continues today. 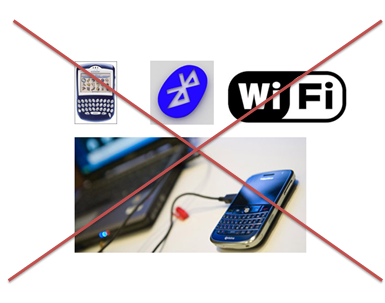 I was told by one of my RIM contacts that the BlackBerry will never be a WiFi hotspot. Perhaps we need to read these never statements like a Steve Jobs never. After all, nobody will ever want to watch a movie on a tiny iPod screen, right? These silly lines in the sand are not exclusive to the BlackBerry device. RIM has over the years had a few BES "nevers" that when you look back makes you scratch your head. Even when RIM held the line on not supporting the BES can't be installed on the exchange server, I must have installed over 75 BES' on the same box. Some small businesses just don't have extra servers to spare and in the real world we installed the BES on the Exchange server. As for the BES not working on a VM server, this really makes me laugh. Back in 2004 I flew out to Toronto for a week of BES training and the lab we were supposed to use was double booked, so we were shuffled off to a backup facility. This was a last minute change and the lab didn't have time to be setup for BES training; so we were given a VM image of a BES environment to install on our workstations. All the while we were being told that "this isn't a supported configuration". I've always loved that line. So with all these fond memories kept close to my heart, I look to the future to see all the goodness that will "never" find it's way on to the BlackBerry smartphone.